Four more pages of been uploaded for Issue 4. It’s coming to a close soon, so on March 1st that should wrap up this Issue. And then we can move on to issue 5. A lot to update about this month. VACANT has been asked to be put onAmilova.com, a website that translates comics. Currently, it’s in French, but soon will be translated into Spanish. A group by the name of “We Make Comics” alsointerviewed me on deviantart about my comics. Michelle and I started a podcast a few weeks ago talking about the VACANT updates. It gets uploaded every Sunday on tumblr. More art has also been posted there if you want to check it out. There will be no more AMCs because I am too busy. The Podcast will now answer them. If you would like to ask me a question about my comic please e-mail me. Three more pages have been uploaded onto the site. Sorry again about the lack of pages lately. I have been in a weird funk, sadly. Also, there is a new review written about VACANT by Darwin Law for those who want to read. A new image was posted on tumblr. 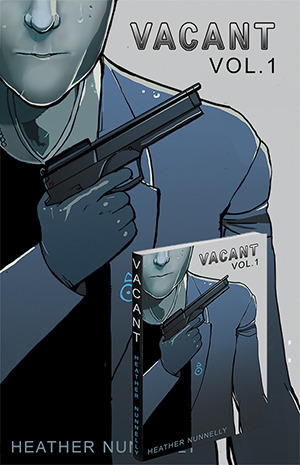 Greg Burgas left a positive but honest of VACANT on Comics Should Be Good. Go here to read. Remember to check out VACANT’s tumblr for new art and Ask My Characters comic strips. I apologize about the late update this month. Yesterday, I was at a wedding. Also, I apologize for the lack of pages. This month I was having a hard time being motivated. Hopefully next month more will be done. I don’t have a good excuse for the lack of work but the fact that I was not feeling like myself. Since redrawing issue 1 was taking too long, I moved on to Issue 4. 6 pages have been uploaded. Page 7 will be uploaded when it’s done since I don’t like cutting the comic off in the middle of a scene. VACANT was talked breifly about on a podcast with Ross Campbell and Nick Marino. Check it outhere. Remember, new AMCs have been added to the archive. Also, there is new questions iin theF.A.Q., and the images have been added to the gallery. So MICE is this weekend and I will be tabling with my sister, Michelle Nunnelly, again. Sadly, because of SPX, I am not prepared. I am out of almost everything, so I’ll be attending more than selling. Sorry guys. You can come and say hi though if your there. I will be prepared at NYCC. I will a few other folk at booth 2245 in the small press section. Issue 1-3, the prologue, and prints will be there. Also I wrote about my SPX experience if anyone wants to read. SPX is coming up this weekend. I will be boothing with Michelle Nunnelly at B12. Come by and say hi if you go! I will be promoting VACANT. Also, the VACANT store is up. Beware, however, it doesn’t seem to like the browser called Opera. Open it up in Safari, Firefox, or Internet Explorer. Pages 1-3 have been posted. I apologize that not all 1-11 are. Due to my internet randomly dying, a vacation to visit family, and not having a scanner, I don’t have them done in time. They are almost finished, however. Within a couple days, I will notify everyone when they are up. I greatly apologize again. VACANT’s Kickstarter has started. It’s a small project right now just to help me print Issue 1-3 for conventions. Right now I simply don’t have enough to last me and don’t have the money to pay for it. The goal is only $500. Even paying $5 helps a lot. Thanks so much. I started the VACANT Newsletter for those who want to know all the happening on the comic and to remind everyone when it updates. If you’re interested just give me your name and e-mail in those blanks to the right. Click subscribe. Ask My Characters Started a couple weeks ago. It’s a gag comic I draw in response to reader’s questions. This is question number one of two. It updates every Wednesday on tumblr. Want to ask one? Click here. VACANT was reviewed a few days ago by GhettoManga. A million thanks to him for promoting the comic. Also, I am now a part of inkOutBreak. If you’re a part of the site, please vote. It’s a really cool site and makes it a lot easier to read web comics. There’s all these nifty things they provide for new artists.